A collection of stork drawings from vintage publications. These large birds are well thought of by many in regions where snakes are plentiful as many varieties of stork enjoy dining on snakes. 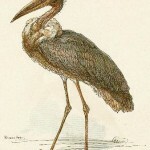 The stork has also been linked with the birth of babies and is often used to herald the arrival of a baby in the family. This collection of public domain stork drawings will hopefully grow to match the size of these stately birds. For now, we hope you find one of our storks useful. Vintage drawing of a pair of storks standing in a garden. 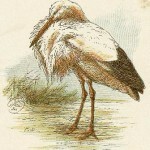 Vintage colored drawing of a stork. Stork drawing by Harrison Weir.